A decadent French sandwich with ham, asparagus and Gruyere cheese. 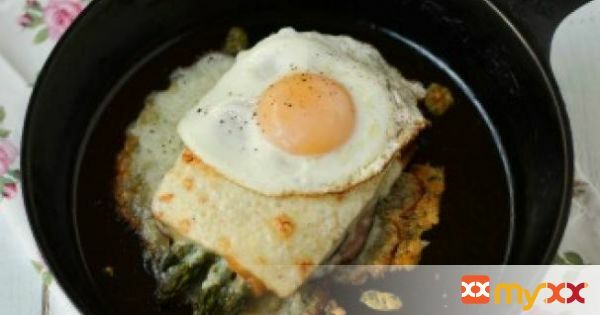 Topped with bechamel and more cheese and broiled to golden brown perfection then crowned with a fried egg. 1. Preheat oven to 400 degrees f. On a large baking sheet, toss asparagus with a little olive oil, salt & pepper. Roast until just tender, about 10 minutes, shaking the pan once or twice to redistribute the asparagus. Remove from oven and set aside. 2. Melt the butter in a small saucepan over low heat, whisk in the flour, cook and stir for about 2 minutes. 3. Slowly whisk in the milk, increase the heat to medium-high and bring to a simmer, stirring constantly, simmer for about 2 minutes to thicken. 4. Remove from heat, add nutmeg, 1/8 t. salt, a bit of fresh ground black pepper, 1/4 c. shredded Gruyere and 1/4 c. Parmesan. Stir to combine, set aside. 5. On another baking sheet, place the bread slices. Bake for 5 minutes, flip bread and bake about another 4 minutes (keeping an eye on it), until the bread is lightly toasted. 6. Remove from oven. Spread 4 of the slices lightly with Dijon mustard, top with a layer of ham, a few asparagus spears and half the remaining Gruyere cheese. Top with the remaining toasted bread. 7. Slather the tops of the sandwiches with some of the bechamel sauce and top with the rest of the cheese. 9. Now broil until bubbly and golden, about another 3-5 minutes. Serve sandwiches topped with a poached or fried egg.